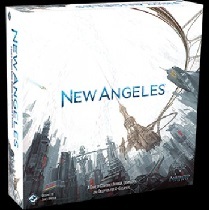 New Angeles is a board game of corporate greed and machinations. 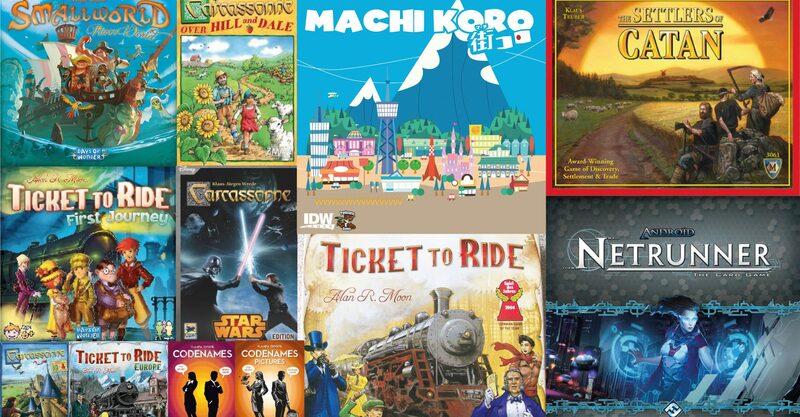 You and your friends each take the reins of a powerful megacorporation. You cut deals and forge temporary alliances to gain leverage and financial superiority over your corporate rivals. All the while, you need to keep a finger on the pulse of the city. You use your wealth and influence to create more wealth and more influence. To do this, you’ll cut deals and forge temporary alliances. You’ll need to keep an eye toward the masses, striking deals with the other corps as necessary in order to keep a lid on crime, disease, and unrest. If you want to maximize your profit, you need to keep New Angeles open for business! Running a business is one thing. Running a city, it turns out, is quite another. But in New Angeles, you have to do both. To keep the people happy and the city running smoothly, you’ll need to generate a specific variety and quantity of resources as determined by each demand card you reveal. These resources are produced among the city’s districts, but only where you have your android tokens available to generate them and only if you’re able to avoid strikes, outages, and the detrimental influence of orgcrime. You can’t let unrest lead to orgcrime and outages. So even as you pursue your profits and diversify your assets, you may also need to keep the little people happy. Happy people make productive workers, and you want to keep the thriving megalopolis of New Angeles good for business. Manipulate, negotiate, and bribe your way to riches. Available here.